If you seek authentic Greek food then look no further, with just one bite at Kamari Greek Taverna Kafe, you will be transported to a little traditional Greek Restaurant in Santorini. I recently had to organise a family dinner in celebration of my mother's birthday. The restaurant strip along busy Brighton Le Sands looked the place to go. Parking wasn't an issue as Rockdale Council have several parking areas with a large off street parking area at The Boulevarde, just around the corner from the beachfront restaurant strip. There were several restaurants along The Grand parade, even though Kamari is smaller than some, I was drawn to its traditional Greek Taverna frontage. It was bustling with happy patrons which was a good sign. I've always admired the European way of life especially when it comes to eating. Australians generally believe our most important meal of the day is breakfast and we often finish the day with a heavy meal in the evening. It is the complete opposite for Greek people, they will often start their day very early, breakfast (Proino) starts with a mere cup of coffee or a sweet bread roll then mid morning they might stop by a street vendor for a little Tiropita (cheese pie) or sesame seeded bagel. The main meal time is often well after midday, around 2pm or later where they will spend a few hours with family or friends eating several courses and indulging with Greek Wine. The last meal they eat is lighter around 8.30 or 9pm. 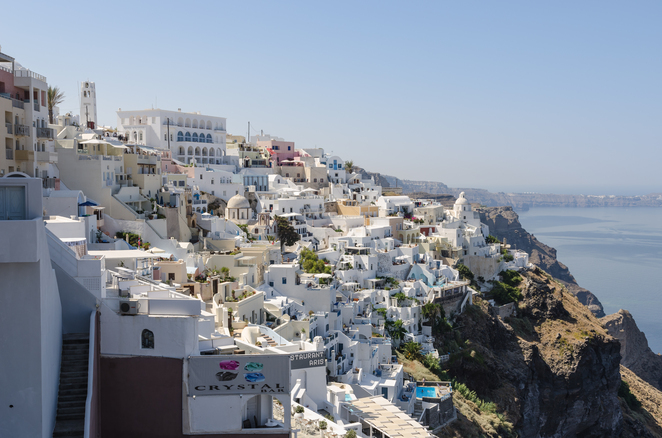 I dream of going to Greece one day and seeing the beautiful country. To eat at restaurants with views like in this photo is on my bucket list, but for now I must be satisfied with enjoying the cuisine offered here. Kamari looked the ideal place. The Greek way of life appeals to me. It was almost 2pm and I could see that Kamari was getting busy. 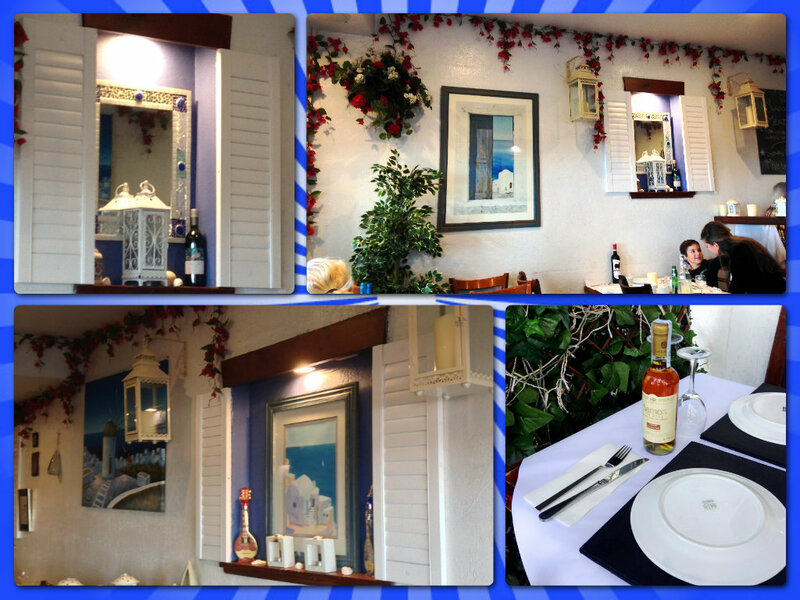 A nice touch was the special of the day offering a glass of Greek Wine or a standard Beer with every main meal. This was ideal as I was driving and my mother and brother also don't drink much. As we tried to decide on food I admired the Greek decor using their traditional national colours of white and blue with ceiling bougainvillea flower draping. The menu was so tantalising. It was truly hard to decide. We were temped to get the Seafood platter as we saw one served and it looked amazing. After much debate we decided on several plates to share. Starting with traditional Greek home-made dips with warm pita bread $14.90, Calamari salad with fresh dill, chilli and olive dressing, traditional mezede of Oktapodi - marinated chargrilled Octopus with lemon and olive oil $18.90. 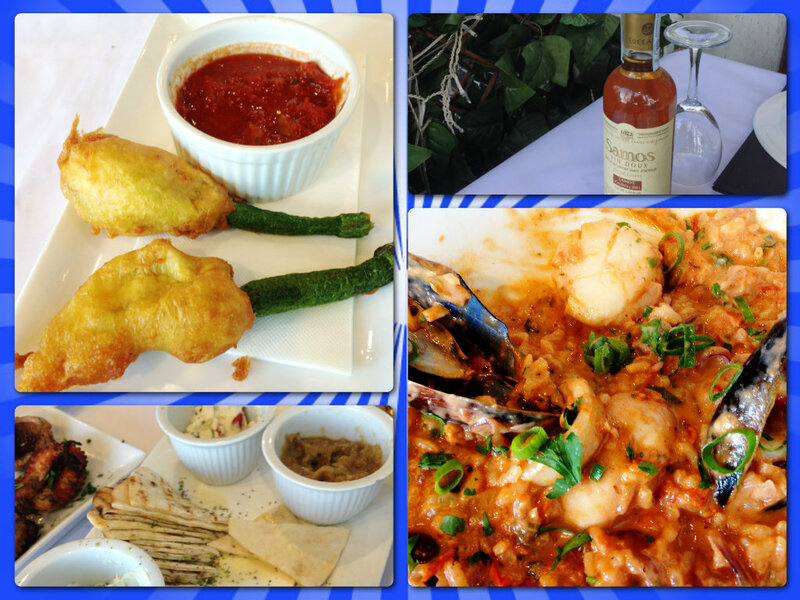 Followed by more delicious food - Zucchini Flowers $14.50, main size Arni Psito (slow roasted lamb) $25.90 and Seafood Pilafi (seafood risotto) $24.90. I didn't get to photograph the Lamb, it was too delicious, so tender, devoured in seconds! After these plates we sat back holding our full stomachs and wished we could fit in more. The staff were all lovely and so attentive. 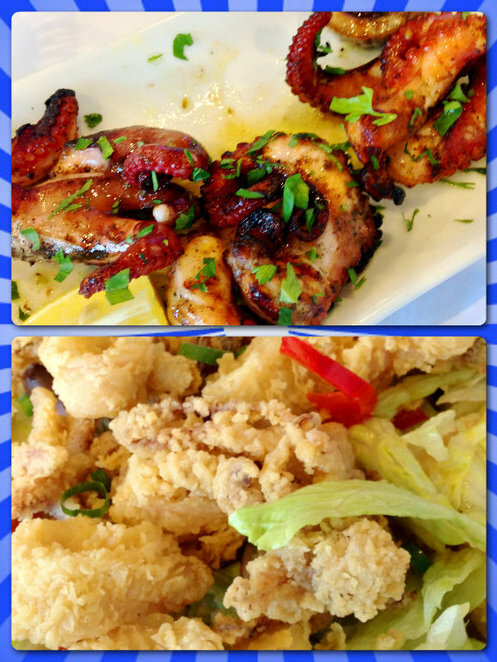 This had proved to be an excellent choice and I knew I would definitely revisit this fabulous Greek restaurant. Keeping in mind that if you eat too much you can always cross the road and go for a walk at the beautiful Brighton Le Sands beach then maybe pop back for dessert! Nice to dream of holiday destinations while eating the cuisine. Lovely story Seafarrwide.